I have enjoyed for a number of years Glenn Gould's 1981 recording of BWV 988, his last. But I actually had the recording courtesy of a former public library, from which I copied it. 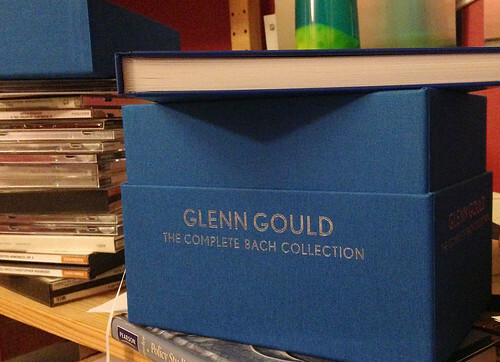 I figured it was time to come clean, so I recently purchased all of Gould's Bach in this giant 38-CD, 6-DVD set from Sony Classical. It not only contains the 1955 and 1981 recordings of BWV 988 (The Goldberg Variations), but concert performances, a "stereoization" of the 1955 recording, and Bach's major keyboard works (Partitas, WTC, Toccatas, English/French suites, etc.). It's all here. The set comes with the CDs in small cardboard sleeves. Each has the original album artwork; each CD has been painted to look like the original records. The backs of the CDs have the original "liner notes" from the records; while they require significant vision acuity to read, they are reproduced at a reasonable size within the set's large book, along with the tracklistings. I've read about Gould several years ago with great interest. This set is a testament to the Canadian, more so than to the composer. But listening, and especially so to the DVDs with Gould talking to us about Bach's music, I can't help but wonder what he would have thought of the world today. The rise of the harpsichordists? The pristine HD (high bitrate) sound? Digital-to-analogue converters? Headphones vs. speakers? Electronic instruments? He speaks to some of this, at least, in a recording on DVD 3, Glenn Gould on Television, with broadcasts by the CBC and BBC. He talks about recordings replacing concert performances, home hifis, and the creative role of the listener at home. At one point, he says in this video "Someone watching this 30 years from now will be able to say whether I am right or wrong…" Indeed, we are. And some of how he talks reminds me of the early recordings of Steve Jobs, predicting the future. The problem with Gould, however, was his is preferences for solitude and his dislike of public performance and his desire for perfectionism that sullied his vision. The major recordings are not new, of course, and I am not sure there is much point in reviewing them individually. In fact, I have yet to listen to each and every disc yet, in full. The early recordings, obviously, have less fidelity than the later ones (from the late 1970s-to the final Goldberg recording). There's the 2- and 3-part inventions recording, too, that has a "bad" piano in it; it's described by Gould as a hiccup. Then there's the use of tack piano (e.g. harpsipiano) in one of the video recordings which, frankly, sounds Frankenstein-ish. And with headphones, there's plenty of Gould's singing to remind you about who is playing. If you're a fan of Bach, and have enjoyed any of Gould's recordings, this is a nice collection to have. I am finding the collaborative works less valuable than the solo works, and here I'd be referring to the viola da gamba sonatas with Leonard Rose, the violin sonatas with Jaime Laredo, and the concertos with various orchestras. It is probably no mistake that you rarely hear about these recordings too; I don't think they work as well, for two different reasons. First, with regard to the concerto recordings, they're not well-done. The orchestras are the wrong size, the recording technology was lackluster, and the overall sound is just harsh. Second, Gould didn't always make a good pairing partner. He's better with Laredo than Rose; with Laredo he's more on equal footing, but sometimes pulls ahead in the texture, when, I think, the violin should be pulling things, if someone has to pull. Some of the gestures on the piano simply don't sound authentic, either because the trills are wrong, or they don't work well on piano (vs. harpsichord). With Rose, Gould tends to be even more dominant. Then there's the singing along. What did the other performers think of this habit of Gould's? Rose plays relatively dynamically, with different articulations, which is in contrast to Gould's mostly equal-temperament with dynamics and certainly with articulation. Hearing Gould speak about Bach and his own playing, it's obvious he was an extremely intelligent man and likely a musical genius. Some of his interpretations have survived the test of time, and are quite good. Others, it sounds, were some experiments. This doesn't mean they are necessarily poor; it means it's too bad Gould wasn't here long enough to re-record some of them. Would we have tried studying authentic technique on the harpsichord? (Those he plays were not historical models, and his organ playing, I'm fairly certain, was quite foreign to an authentic approach.) Would he have explored more creative tinkering by listeners with recordings? Probably my favorite part of the set is his interview after his second recording of the Goldberg Variations with Tim Paige. The almost pompous, cerebral, and intimidating persona that Gould projected in many of his television discussions, somehow had warmed in this late interview, recorded in the 1980s right before his death. While he was nevertheless the same person, with the same intellectual depth, he also seemed far more personable; gentle, perhaps. You get the sense that the person talking is a real person, not some monster/genius with whom you'd never really understand. And his thoughts about performance, specifically of Bach and that everything can work (i.e., we can be historically "authentic" if we choose, and use a harpsichord, or we can "rearrange Bach" to other instruments, including the piano) was absolutely refreshing. I know there are many hours ahead of enjoyment and learning with this set of recordings. I'm anxious to continue, both to better understand this important performer who may have been too early for his time, and also the music of Johann Sebastian Bach. Gould, it is obvious, loved Bach's music, as do I.